If you want to learn and support refugees and other precarious migrants, join our team of volunteers and make a difference. READY TOUR is a free program for refugee claimants waiting for their refugee hearing. Ready Tours are schedule twice a month in the morning time. For many refugee claimants the time before their hearing is stressful. The refugee hearing caused them additional stress and anxiety. Deadlines during the process and what to do if there is problem. Every act of generosity counts: show your support on Given Tuesday!! FCJ Refugee Centre is making a call to everyone during this season to reflect on generosity and the work the centre does in making society a better place for vulnerable populations. During this giving season, FCJ Refugee Centre calls on everyone to consider making a gift to show your support for refugees and other precarious migrants. 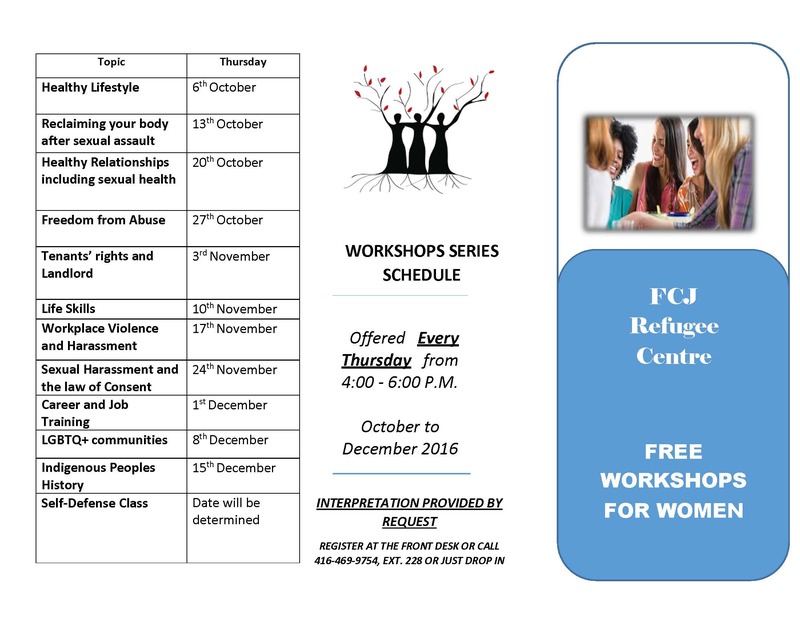 FCJ Refugee Centre relies on supporters like YOU to carry out important work so that we can walk with uprooted people in our community. We support refugee claimants, those without status, migrant workers, women and children in need of housing, we have a free health clinic, run a vibrant youth group and many other important initiatives that need support! Due to immigration issues the event o has been postponed. We will keep you updated. How Monsignor Romero’s philosophy is still relevant to the defense of human rights and today’s reality in Central America and elsewhere? FCJ Refugee Centre invites you to celebrate the canonization of Monsignor Oscar Romero. Monsignor Romero spoke out against injustice and brought attention to the underprivileged and the dispossessed. Today we see this type of dispossession through forced migration, and refugees fleeing war, social violence, gangs, poverty, and other factors. How can Monsignor Romero’s approach help those of us who are working to defend those who are excluded in the present day? Fr. Chopin has been unwavering in his efforts to secure justice in the assassination of Monsignor Oscar Arnulfo Romero, on 24 March 1980. And he is also extremely qualified to speak about the legacy of Monsignor Romero and on how his philosophy can inform our struggle for human rights in the current times. Investigations by the United Nations, and other international bodies have established that the four assassins of Romero were members of a death squad led by Major Roberto D’Aubuisson, founder of the ARENA party. Fr. Chopin points out that three separate institutions have incriminated D’Aubuisson in the case: the Truth Commission, the Inter-American Commission on Human Rights, and the Vatican Congregation on the Causes of Saints. He has been very active in refuting the claims of the ARENA party that their founder was not in fact the mastermind behind the murder.